Have you been looking for a comprehensive list of all the ways The Wind Waker HD is different from The Wind Waker? Then look no further! NeoGAF.com user Nyoro SF has put together a list of changes in the HD version of this beloved classic. Click the jump to read the full list! Can now acquire the Swift Sail in the Windfall Auction. Swift Sail doubles sailing speed and forces wind to always be at your back. Getting hit while in your boat doesn’t knock you off of it unless you take an excessive impact. Can now take up to 12 Pictographs. No longer need the Bug from the Forest Haven to finish the Deluxe Pictobox quest. It is upgraded automatically after you do Lenzo’s three picture requirements. Each photo now gets a rating the moment you take it, as opposed to when you arrive to exchange it. Pictographs can be submitted multiple times in one visit to be exchanged for figurines. Can download/submit Pictographs using Tingle Bottles, making collecting the tough/missable ones MUCH easier. Also, you get to keep your photos if you send them via Tingle Bottle/Miiverse. Added Hero Mode: Available from the start, can toggle before loading your save. Take double damage, no heart drops of any kind. Can only heal via fairies, soup, potions or heart piece pick-ups. Five Triforce charts have been replaced by the actual pieces. Five new Treasure Charts were added into the quest to take the place of the Triforce Charts. The starting wallet now has an upper limit of 500, as opposed to 99. Tingle is introduced as part of the main quest. Orca no longer knocks you down if you screw up the sword tutorial once. Tingle Statues are now found by laying down regular bombs instead of the Tingle Bombs (that no longer exist) at their hidden locations. There is no prompt or hints in game at their location anymore, meaning they likely just wanted you to check the internet! Forest Water now expires in 30 minutes instead of 20. Enemy Orbs always drop said enemy’s special item, e.g. Joy Pendants, Skull Necklaces and Knight’s Crests. The Hero’s Charm (Item that allows you to see enemy health levels) is now claimed at the end of the Savage Labyrinth rather than from Ms. Marie. Can now alter grapple swing direction while swinging. Can now move in first-person view while aiming the Bow, Hookshot, Grappling Hook and Boomerang. Addition of gyroscope aiming controls (which can be disabled). Can no longer snipe Molgera’s tongue out of the air using the Hookshot. Enemies have less invincibility after being struck, allowing multi-hits from Thrust attacks. Deku Leaf now has a green indicator which shows where you will land on the ground if you cancel the Leaf. Magic Armor now requires rupees to use instead of magic. UI & Animations & Misc. Pulling items from the sea floor is about 4x faster. Text speed is much faster. 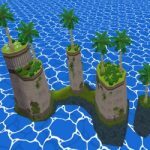 Wind Waker songs will no longer repeat themselves after being conducted once. 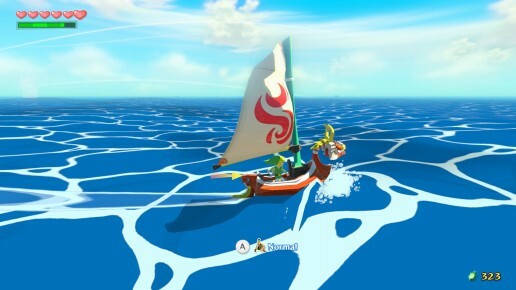 Wind Waker’s beat only starts when you conduct the first note, as opposed to being constant. Wind direction change option has been moved to the bottom right, as opposed to being a full screen overlay. Wind direction change option no longer auto-points based on the direction of the thumbstick, but has to be pushed left and right manually like a clock. Wind Waker has been moved to a permanent position on the Gamepad’s D-Pad; no need to go into the menu to equip at any time. Grappling and cannon options while sailing are permanently on the D-Pad. No need to equip while sailing. Cannon firing now has a tracker showing you the trajectory of your bomb and where it will land. Can now hotswap items on the GamePad without having to go into a menu (You can still pause to swap). Can alter camera controls to be reversed (thanks GameXplain). Can remove HUD from the screen entirely save for hearts, magic and quick prompts. Can review fish advice from the GamePad map without having to re-feed them bait. Items that enemies drop and the ones you break from the Orbs take longer to disappear. Enemies that die at sea now have their items fly towards you as drops. Accuracy is hit-or-miss. Do you see any changes that aren’t listed here? Let us know in the comments!